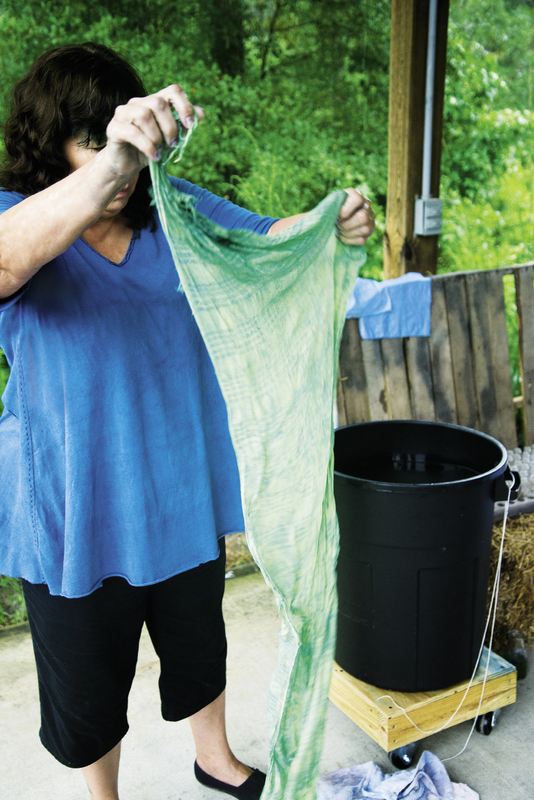 After preparing her dye with indigo extract, Donna folds in damp clean linen in an accordion fashion and continually swirls the fabric for about a minute to prevent air bubbles as it turns a chartreuse green. She squeezes out the excess water and pulls the linen out in a ball; contact with the air begins its transformation into a teal-green. Then she dips it in a solution of water, soda ash, and hydrogen peroxide to set the dye. Knowing that the fabric will dry two to three shades lighter, she continues the process until the color is to her liking. Donna Hardy remembers going to Grant’s department store as a young girl in Georgia and being fascinated by a wall stocked with yarn. But that’s about the only thread from her past that might explain why this Georgia native and textile enthusiast finds herself driving to Ravenel on a muggy July morning with hoes, watering cans, and fish emulsion rattling around in the back of her Jeep. Or why there’s a perpetual crust of dirt under her fingernails, although it’s hard to tell given that her fingernails are perpetually blue. Donna’s driving from her home in West Ashley to Rebellion Farms, where she puts her last name to the test for four or five hours most every morning—weeding, tending, weeding some more—cajoling a crop of indigo bushes. Yes, indigo, as in the inky azure blue. The color of midnight on a cloudless new moon. The color of the jeans you’re wearing and the background hue of the South Carolina flag stirring in the limp breeze on your neighbor’s porch. The shade of deep sky, deep sea, deep dreams. The color that’s so ubiquitous, alluring, and beloved and has been since the ancient days of Thebes (2500 BC, in case your history is dusty), that you might imagine the indigo plant from which it comes must be ubiquitous, too. But you’d be wrong. 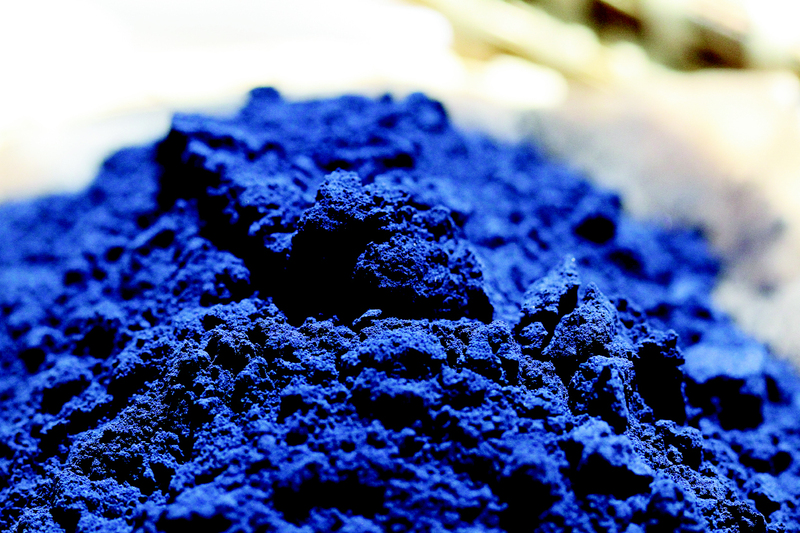 “India and China, and a little bit in Guatemala, are the only places where indigo extract can be sourced,” Hardy explains. Indigo can be derived from more than 300 species of plants the world over; all contain the chemical indican, the precursor of indigo. 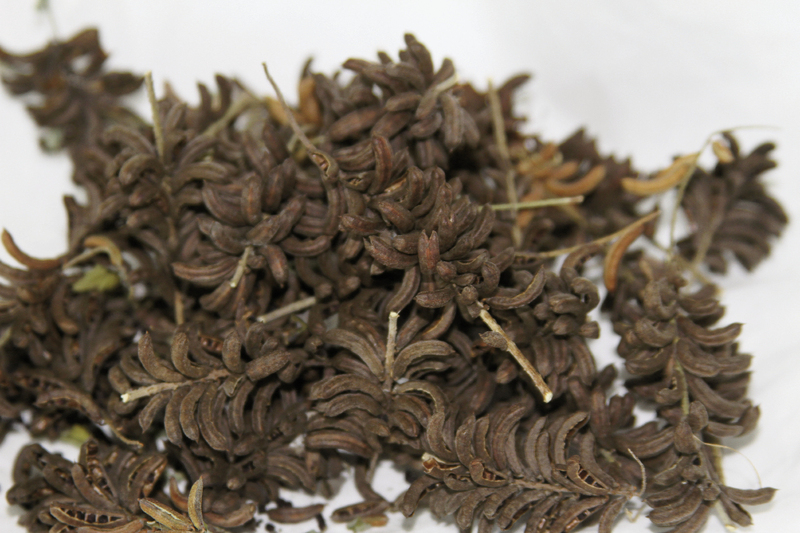 However, only two, Indigofera tinctoria (which hails from India and parts of Africa) and Indigofera suffruticosa (native of South and Central America and the source of Mayan Blue used on the temples and pottery of the Yucatan Peninsula), produce the majority of the extract used in the blues coveted around the world—from the Tuareg tribe of the Sahara for whom indigo symbolizes power and status; to the DOBAG weavers of Turkey; to today’s hipsters shelling out big bucks for naturally dyed, raw denim jeans (slim-legged, of course). 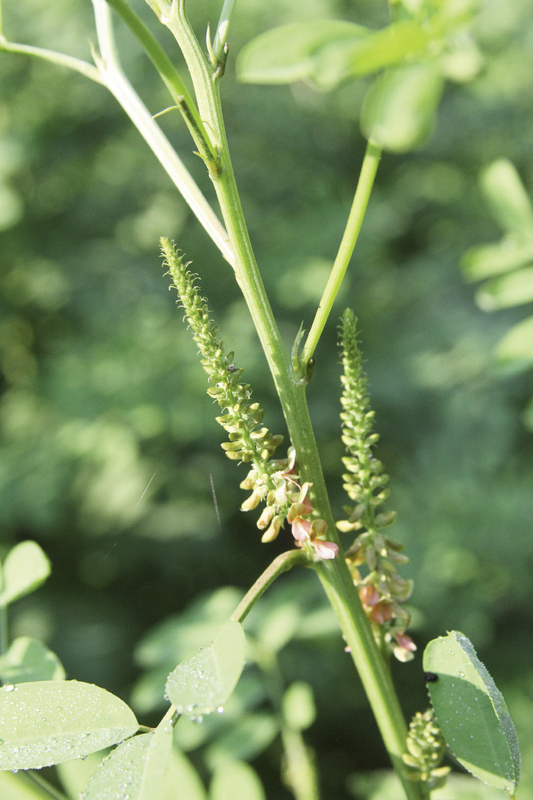 And it’s those same Indigofera that have historically grown in the Southeastern United States. 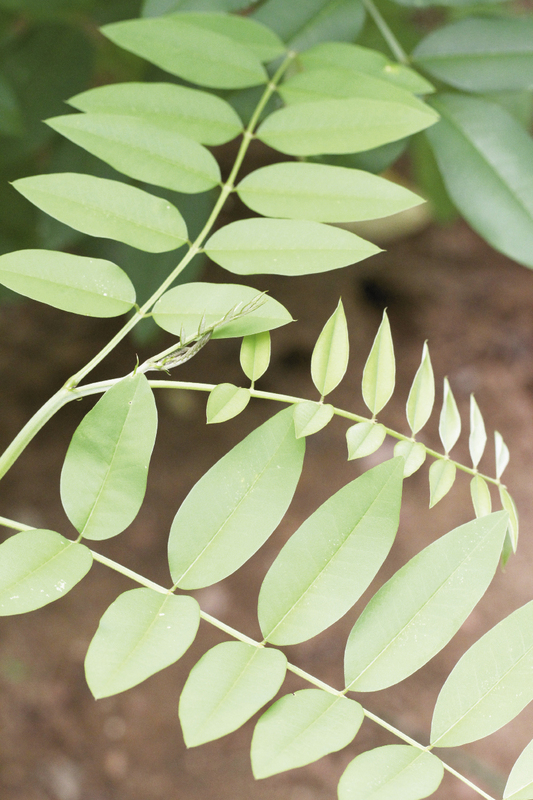 Our indigos, with compact oval leaves on bushes that can grow some 10 feet tall, hail from the legume family and look a little like a bay leaf plant. You can extract reds and oranges and yellows for natural dyes from any number of insects (cochineal), roots (madder, yellow dock), and plants and trees (marigolds, onion skins, Osage orange, chestnut), but true blue is a different story. For Donna Hardy, it’s a story that has captivated her imagination, cultivated her inner farmer and historian, and lured her from the mountains of North Georgia to the fields of the Lowcountry with a vision of reviving what was once the second largest cash crop in South Carolina. Before the first synthetic dyes were discovered in 1856, “the color in every textile, every cloth came from natural sources—from leaves, roots, bugs, or minerals,” Hardy explains. 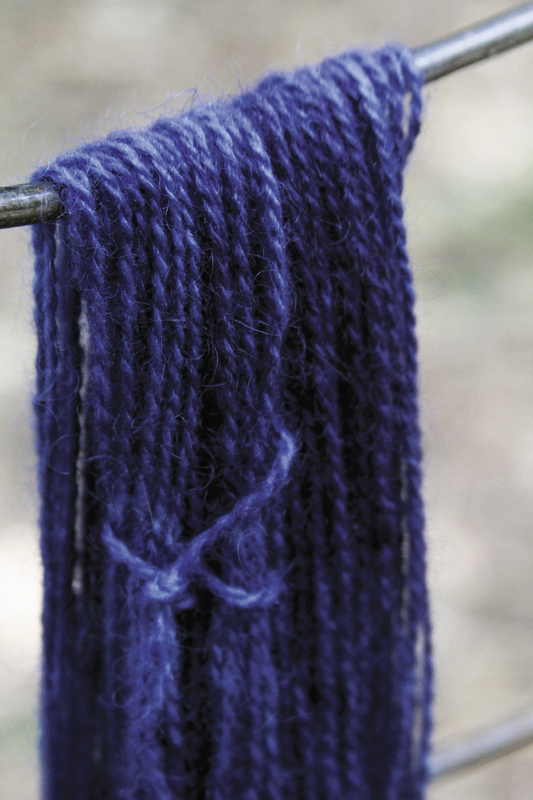 Wipplinger pioneered the revival of natural, more sustainable dyeing processes, using the plant-based extracts of old as an alternative to synthetic petroleum-based dyes and toxic heavy-metal mordants. “As soon as I met Michele, I knew I wanted to learn as much as I could from her,” says Hardy, who would fly to Seattle for a few weeks each summer to intern under Wipplinger. Like a piece of cotton dipped in a dye bath, Hardy soaked up textile knowledge, botany basics, and agricultural history. She learned the ephemeral alchemy of fermentation and mysterious extraction processes that ultimately transform green indigo leaves into a tealish-green concoction—a vat of dye into which a naked beige cloth gets baptized and emerges reborn as a soft cerulean “wow.” In the meanwhile, “life happened,” says Hardy: her kids grew up and her 35-year marriage ended. 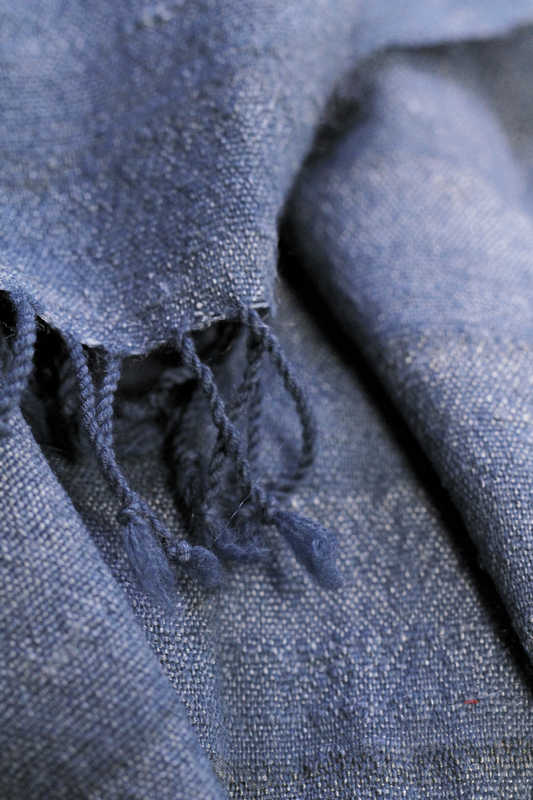 Post divorce, Hardy moved to a quiet cabin in the North Georgia mountains, and from there continued researching textile history, natural dyes, and indigo in particular, discovering, lo and behold, that Charleston was once the epicenter of a thriving North American indigo cultivation during a 50-year “indigo bonanza” period that ended with the Revolutionary War. In 1775, she learned, South Carolina exported nearly one million pounds of indigo to England, thanks in large part to an enterprising young woman named Eliza Lucas, who became Eliza Lucas Pinckney, agricultural entrepreneur and mother of Charles Cotesworth and Thomas Pinckney, two prominent patriots and political leaders. In 1739, Lucas’ father, a colonel in the colony of Antigua, returned to the island, leaving his 16-year-old daughter in charge of his three plantations. “I love that this is history from a woman’s perspective—to imagine a 16-year-old running her father’s plantations,” says Hardy, who today lives barely a mile down Wappoo Creek from where young Eliza experimented with planting the indigo seeds her father shipped from the West Indies, a trial-and-error struggle that, after five years, yielded North America’s first commercially successful crop in 1745. Hardy spent two years traveling back and forth to Charleston researching indigo history, only to find very little actual documentation. She scoured the Lowcountry’s Sea Islands looking for naturalized Indigofera suffruticosa, which she eventually discovered (in an undisclosed location). 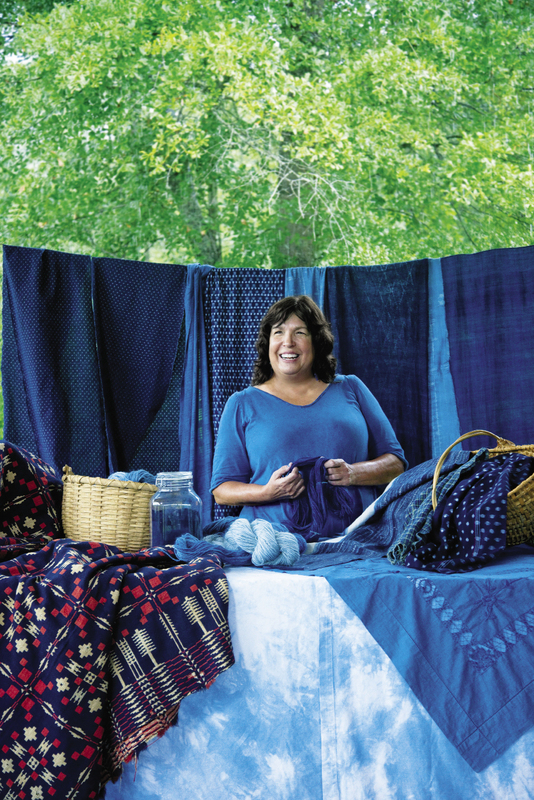 Hardy’s ultimate quest: to reintroduce the once-thriving local indigo culture and thereby expand sources for natural dye extracts. “If they grew indigo here then, why can’t we do it now? Why be dependent on chemically manufactured dyes that are polluting rivers in China and Bangladesh, where most textiles today are manufactured?” asks Hardy, who moved to town a year and a half ago to finally, literally, dig in. On a third of an acre at Jeff Allen’s Rebellion Farm, an incubator for those interested in sustainable agriculture and heirloom/heritage crops, Hardy has planted 300 native indigo plants, some Sea Island cotton, and a 50-by-100-foot patch of Carolina Gold rice. “You realize you’ve just planted a field of the crops that established Charleston,” Allen told Hardy once the seedlings were in, thanks to a “Crop Mob” crowd-muscle effort sponsored by Lowcountry Local First’s sustainable agriculture program. 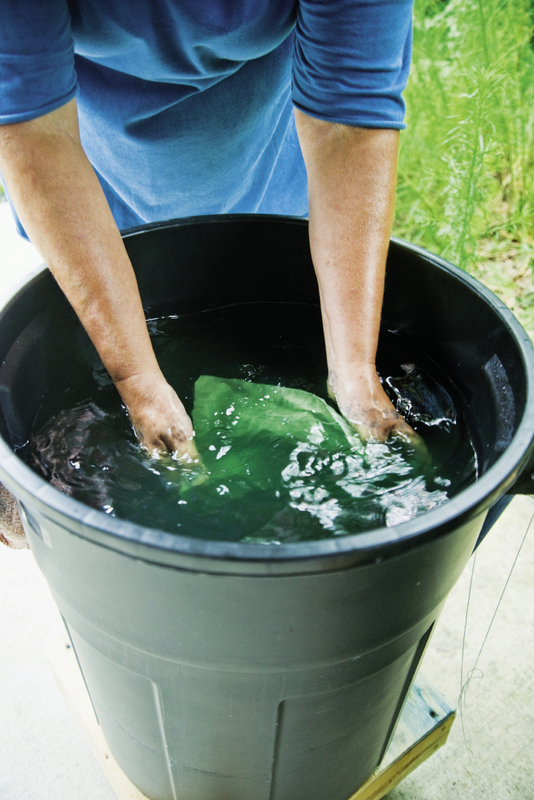 “Watch this,” Hardy says as she dips a white cloth into a black vat of greenish liquid. Her garage is full of garbage can vats, burners, drying racks, shelves stocked with Mason jar potions—a low-budget (and legal!) version of Walter White’s lab á la Breaking Bad. She lifts the cloth out; it’s a light shade of green that then turns to chartreuse, then morphs to a teal before transforming, as if a magician’s wand has passed over it, into a soft, vivid blue-jean blue. The same color as Hardy’s fingernails that get “painted” with each dip (“I don’t like wearing gloves,” she notes). 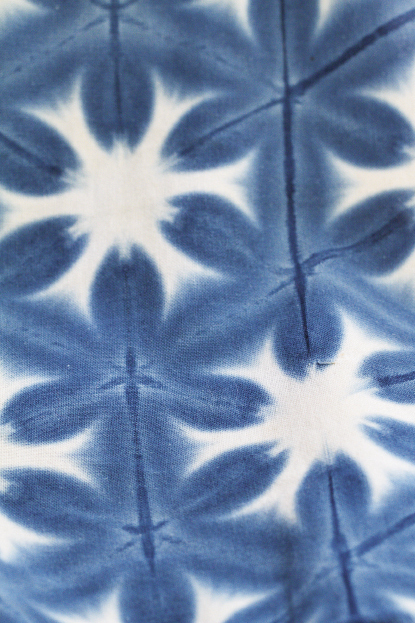 “Indigo is one of the first dyes ever discovered and the only dye that does that [changes colors]. It blows my mind to imagine how they figured it out,” she says. 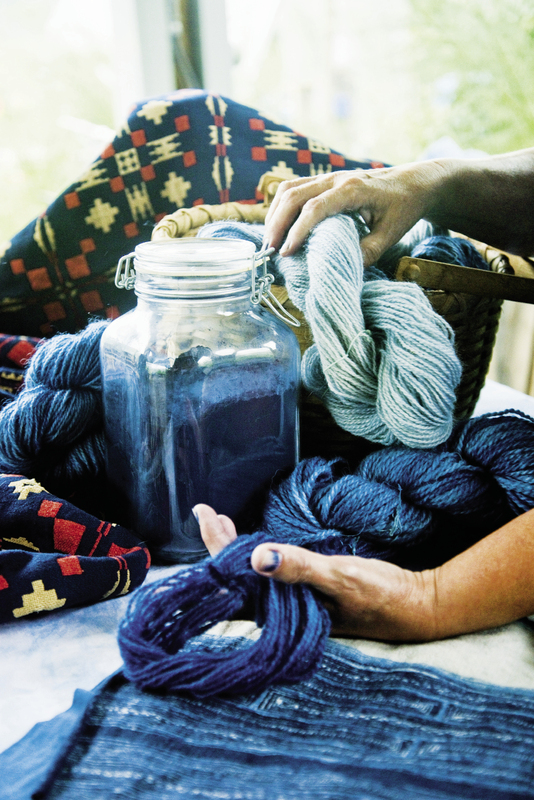 Indigo works its mysterious, moody magic on fabric, and on farmers, as Hardy is learning. The task of weeding and watering a third of an acre (she’s zealous about organic farming, rebuffing Allen’s suggestion to “hit it with a little RoundUp”) is all-consuming for now. “I’m a little obsessed,” she confesses. But like her predecessor, Pinckney, more than two centuries ago, Hardy is determined to make a go of it. In addition to the demonstration fields she’s tending at Rebellion Farm, she’s working with Dr. Brian Ward of the Clemson Coastal Research Center to cultivate heritage indigo seeds from the plants she discovered on a local Sea Island—descendants of the crops originally grown here 250 years ago. She’s also received funding from the Carolina Gold Rice Foundation to support these efforts. 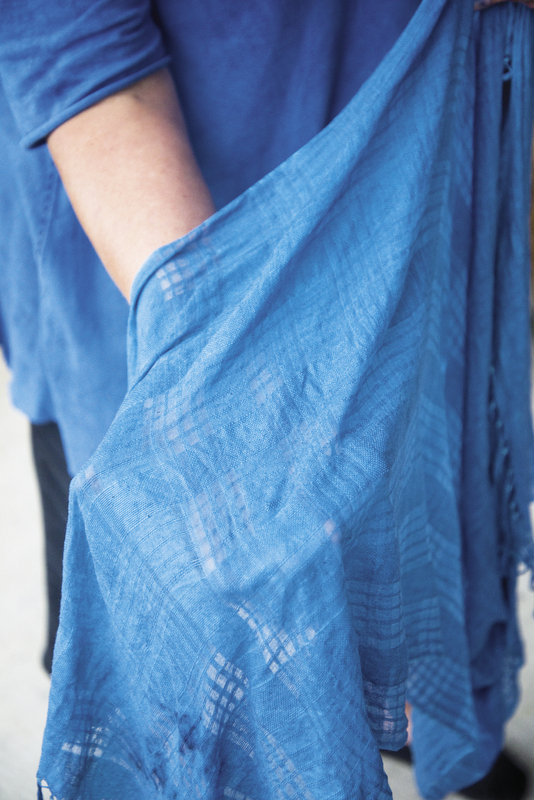 One day Hardy envisions harvesting her Sea Island cotton, spinning it into thread, weaving it into cloth, and dyeing it with Sea Island indigo grown in local fields. It’s a long way from bulking up the basil and rosemary plants in her backyard garden. But until you plant a seed, or 300, you never know what might grow. 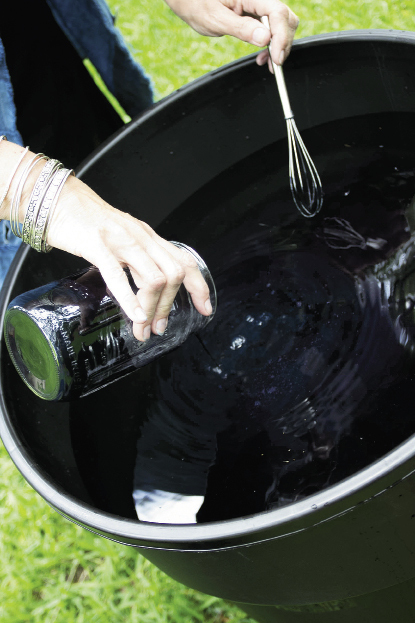 ■ A two-day class on indigo dyeing using the same strain of indigo plants grown in the region more than 250 years ago; it’ll teach how to create a fresh-leaf indigo vat, make indigo leaf eco-prints, and experiment with various dyeing techniques. The three-day retreat costs $695 and includes meals and transportation to and from Rebellion Farm. For more information or to register, visit www.seaislandindigo.net/workshops.